Whether it's a commercial contact or simply a backyard project, mastering the job requires a solid first step. 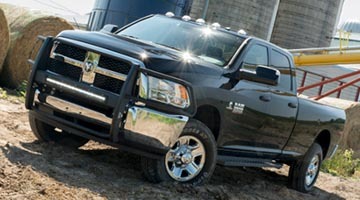 While most side bars and running boards are primarily meant to improve the look of the vehicle, ARIES RidgeStep commercial running boards are designed to master tough jobs and make it look easy. 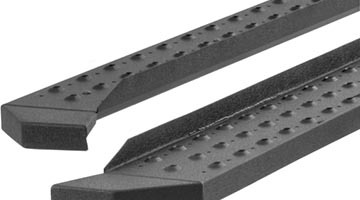 Unlike other side accessories, RidgeStep running boards are built without any plastic parts. From their brackets, to their base structure, to their punched-hole treads, they are constructed from high-strength steel. This not only provides a solid step up into the vehicle, but also makes them fit for the harsh conditions of the jobsite. 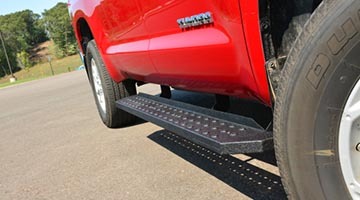 RidgeStep running boards feature a 6.5" wide surface for a safe, comfortable step and have stamped steel treads. The treads offer a non-skid surface that will never crack or wear down, and because they feature protruded holes, dirt and grime can easily pass through, keeping the step clean and free of buildup. The boards also have angled, welded end caps to provide a no-nonsense accent on the truck. To make sure RidgeStep running boards not only provide solid footing but can also outlast the elements, we cover them in a tough, tested finish. We use a highly durable textured black powder coat that easily resists water, salt and rust, and increases slip resistance for added safety. The textured surface is also uniquely designed to hide dirt, grime and minor scratches to help maintain clean, professional finish no matter where the job takes you. RidgeStep commercial running boards install using vehicle-specific brackets and a universal track mounting system. While the brackets are unique to each vehicle application, the boards come in four base lengths, each with an 8mm channel on the bottom side. The channel allows the mounting hardware to slide along the length of the board to perfectly fit each vehicle and attach securely to its frame. This provides a custom fit and allows other boards to be used with the same set of brackets. RidgeStep boards come in lengths of 53", 75", 85" and 91". A unique pairing of boards and brackets must be used for each vehicle application. Heavy Ddty build - With all-steel construction and a durable textured black powder coat finish, the boards are designed to face tough jobs, day after day. Reliable footing - High-strength steel mounting brackets provide a solid step, while the non-skid, stamped steel treads will never crack or fade. 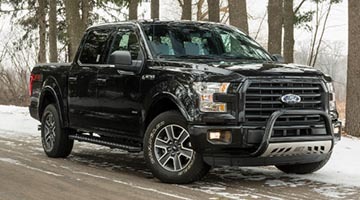 Track mounting system - Using vehicle-specific mounting brackets and a track mounting system, each board is made for easy, no-drill installation and a custom fit.